Allahabad High Court ARO, APS, Driver Result 2019 Stage 1: Allahabad High Court will announce the result for APS, ARO and Driver recruitment exam soon. AHC has recently conducted written exam (stage I) on 24th and 25th February 2019 for the recruitment of candidates for 341 posts of Assistance Review Officer (ARO), Additional Private Secretary (APS) and Drivers Grade-IV (Group-C, Class-III) in the court. 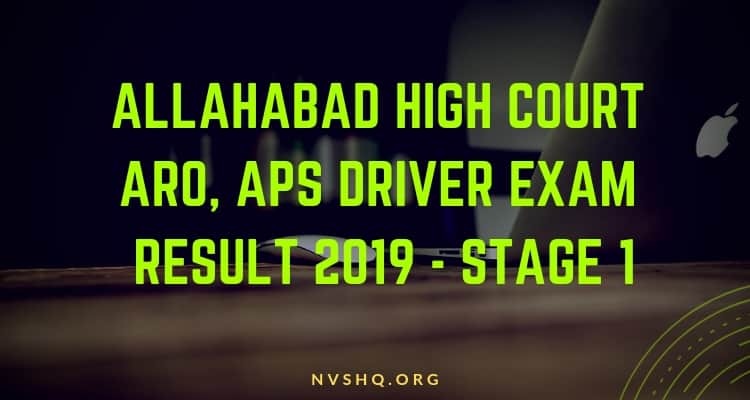 In this article, learn about how to download Allahabad High Court Stage 1 Result 2019 Aro, Aso and driver requirement. The answers keys to all the question papers are currently available on Court’s website. Link for which is given below. The select list or result for the written exam will be declared soon on the official website. Those who are curiously waiting for result can check it from there or also at this page. So, all those who feel they have performed well in stage I can prepare for stage II. As soon as official result dates will be notified we will update the same here. Keep moving ahead in the article and all necessary details related to Allahabad High Court APS, ARO, Drivers exam result. Conducting authority has declared the answer keys to the exam conducted on 24 and 25th February 2019. Answer key contain answer keys of all the sets of questions paper for each post. Examinees who have not checked the respective answer keys can check it now. They can also fill objection forms against the answer key in case they are not satisfied with it. The last date for filling objection is 3rd March 2019. Those who want to file objection must fill it before the due date. After the evaluation and review of all the objections, final answer key will be released. Once final answer keys are published, Court authority will publish the result of stage I. The result for all the posts of APS, ARO, and Drivers will be declared on the same day. The result date will be out soon. Court is going to announce the result on its official portal. No result will be communicated separately or will be sent individually to any candidate. Examinees can only access through the online mode. They do not require any login credential to access the answer sheet as it is announced in a PDF format. The result will indicate the name of the selected candidates. Examinees need to go to the official website of Allahabad High Court i.e. http://www.allahabadhighcourt.in. On the homepage, they have to click on the “Recruitment” link. Now they will be landed on the result page. They have to click on the relevant result link among the various options provided under the list of recruitments. The result PDF will open on the screens. Candidates can check their names in the result list. Lastly, they can download the result PDF for their personal record. AHS result for all the three posts is supposed to release in the form of a PDF sheet. Court release result of most of its recruitment exams in a PDF form. Candidates do not require any login credentials to access the result that are released as PDF file. They can easily access their result just by clicking on the relevant result link. The result of this recruitment exam (i.e. stage I) will carry the names of the shortlisted candidates along with other information. Names of the shortlisted candidates, roll no., registration no., post for which they have applied, Year, category, date of birth, parent’s name and instructions regarding the next round. All the information mentioned on the result sheet about the candidates will be based on the application furnished by the candidates in the application. In case of any mistake and discrepancy in the name or any other details, candidates must contact the concerned authority for correction. ARO- After the declaration of Stage I, ARO candidates will be called for Shorthand and Computer Knowledge Test (stage II). APS- These participants have to appear for Computer Knowledge Test (Stage II) after the announcement of result. Drivers Grade-IV (Group-C, Class-III)- These candidates have to go through a Driver Trade Test which his basically a driving test. The date, venue and time for stage II will be notified to shortlisted candidates through the official website and registered email or mobile no. Candidates who will qualify stage II will be selected. These selected candidates have to verify all their documents at the venue assigned to them. Once verification of documents will be over, final selection will be made. Court will update the final selection list on its website and will award appointment/ joining letters to the selected candidates. If you have any question of Allahabad High Court result stage 1 written exam 2019, you can ask us in comment box below. Anne wala h, Wait kariye. Sir ahc driver ka 1 stage ka result kab tak ayega jiska exam 24 feb 2019 ko hua tha.